In a market where premium sedans—including premium performance sedans—abound, if you want to break through, you need to do something different, especially when, over a century of heritage notwithstanding, your cars make comparative cameo appearances. Enter the Alfa Giulia. The Alfa Romeo Giulia Quadrifoglio. Which is, roughly speaking, Italian for “really fast sedan.” It lapped the Nurburgring in 7 minutes, 32 seconds, which set a record for a production midsize sedan. What’s more, it even has a trunk that you can put the groceries in. Perhaps the third-most famous thing in the movie The Graduate (after “plastics” and Mrs. Robinson, not necessarily in that order) is the car that Benjamin Braddock, Dustin Hoffman’s character, drives: a 1966 Alfa Romeo Spider 1600 Duetto. That movie came out in 1967. Alfa has not been much in evidence in the U.S. new car market for the past several years. It made its real return with the 2015 4C. However, know that this car, which is manufactured in the Maserati (sister company) facility in Viale Ciro Menotti, in Modena, Italy, is produced at a rate that is more akin to hand production than mass production: the assembly line allows 20 minutes per station. While most typical production plants would have the carbon fiber monocoque that serves as the skin of the car onto the front and rear chassis members with a robot, it is manually performed in Modena. And painting for those two-seaters is performed outside of the plant, so factoring that into the time required for production is further indication that this is a car that you’re unlikely to see parked in driveways up and down your street (i.e., in 2015, its first full year of availability in the U.S., there were 663 4Cs delivered; through the third quarter of 2016, there have been 411 delivered). But now it has something new. Something that is capable of serving as a family sedan. 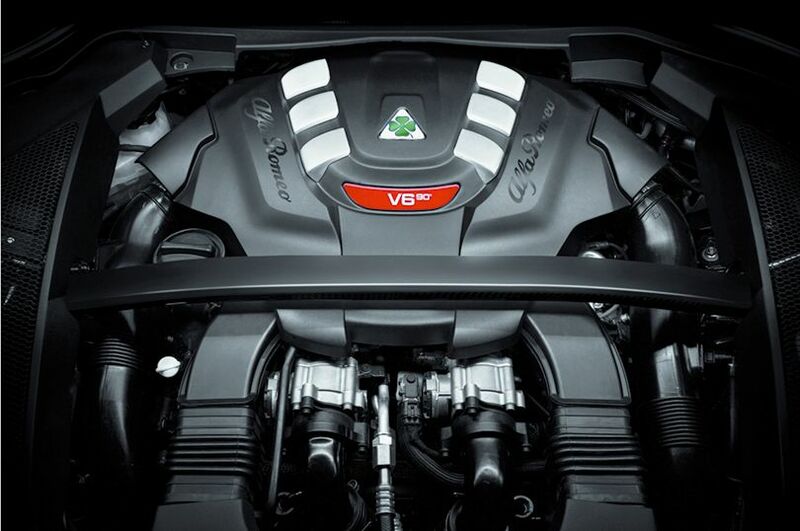 Something with exquisite Italian design, inside and out. Something that is available with rear-wheel or all-wheel drive. Something that has an all-new eight-speed automatic transmission (co-developed with ZF) available with column-mounted paddle shifters, a transmission with a compact package (four planetary gear sets with five shift elements [three multi-disk clutches and two brakes]) and the ability to make shifts in less than 100 milliseconds). Something that has either a 2.0-liter four or a 2.9-liter six under either a steel or carbon-fiber composite hood. And it is there where we have to make a stop because when it comes to the engines, the Giulia is not your everyday grocery-getter. There are three versions of the Giulia: the Giulia and Giulia Ti. The latter, Turismo Internazionale, is a higher trim level than the Giulia. Both of these models are available with an all-new, turbocharged all-aluminum engine. More specifically, this engine features a MultiAir2 valve system, four valves per cylinder with a silent chain-driven timing drive. There is a direct-mount twin-scroll turbocharger with electric waste gate actuation. The cylinder head is made with an air-quenched cast aluminum alloy and features an integrated exhaust manifold. The block is an aluminum alloy with cast-in steel liners. The crankshaft is forged nitride steel that’s been superfinished. And it produces 280 hp at 5,200 rpm and 306 lb-ft of torque at from 2,000 to 4,800 rpm.